There’s more confusion about Star Trek: Discovery’s Klingons. A Silence of the Lambs star joins Jurassic World 2. A familiar face will return for Ant-Man and The Wasp. Plus, the man behind Castlevania still wants to do his dark Power Rangers show, and Supergirl recruits Dean Cain once more. To me, my Spoilers! Director John Boone has posted art by Ashley Guillory of Rahne Sinclair, a.k.a. the werewolf-y mutant Wolfsbane, on Twitter. 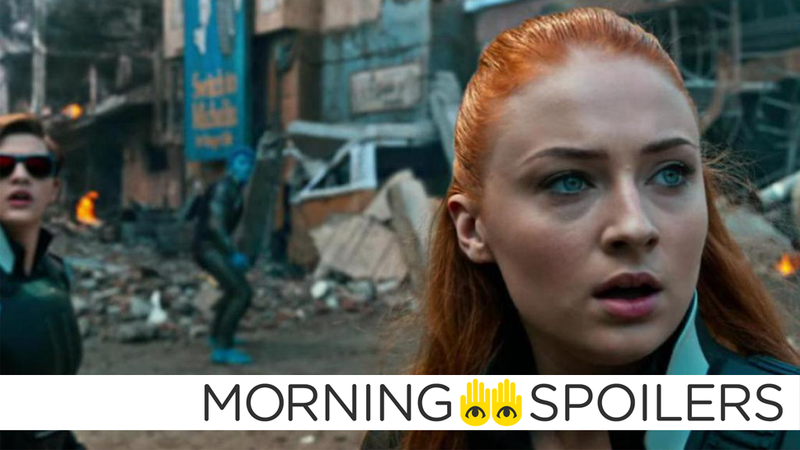 Boone didn’t explicitly state if this is meant to be concept art for the film’s take on the character, but most interestingly, he tagged Game of Thrones’ Maisie Williams in the tweet, seemingly rekindling those earlier, Fox-denied rumors that Williams—alongside Anya Taylor-Joy, mentioned in the same report as playing Magik—had signed on to join the X-Men cinematic universe. Dave Bautista has joined the cast of Drew Pearce’s scifi thriller, about an underground hospital for hardened criminals in a futuristic Los Angeles. Michael Douglas has confirmed that, unsurprisingly, he’ll be returning to play Hank Pym in the sequel. He also mentioned on Facebook that production begins in July. According to Danny McBride, his new Halloween film will effectively replace cult favorite, Season of the Witch, as the third film in the franchise. You know, it’s not a remake. It’s actually, it’s gonna continue the story of Michael Myers in a really grounded way. And for our mythology, we’re focusing mainly in the first two movies and what that sets up and then where the story can go from there. This TV spot includes some snifters of new footage, but more importantly, David Bowie’s Suffragette City. Wizards of Waverly Place star Bridgit Mendler will star in a new comedy series from Fox about Arctic research scientists. The synopsis for episode six of the season, “Faster, Pussycats! Kill! Kill!” homages the Russ Myer classic. With Riverdale High’ annual variety show around the corner, Valerie’s (guest star Hayley Law) efforts to help Archie (KJ Apa) prepare for his big performance lead to some major fallout between her and Josie (Ashleigh Murray). Meanwhile, Betty (Lili Reinhart) and Jughead’s (Cole Sprouse) investigation into Jason’s death brings them to a home for troubled youth and face-to-face with Polly (guest star Tiera Skovbye). Just as her relationship with her mother was on the upswing, an unexpected betrayal sends Veronica (Camila Mendes) spiraling, while Josie deals with her own pressures at home after her overbearing father returns for her performance at the variety show. Finally, Hermoine’s (Marisol Nichols) first day at Andrew’s Construction finds her and Fred (Luke Perry) growing closer. It’s going to be pretty massive. There’s a battle between Grodd and his own gorilla friends/ There’s a stampede, and there’s a huge gorilla fight towards the end of the first episode. THE EPIC CONCLUSION TO THE TWO-PART BATTLE WITH GRODD; When Grodd (voiced by David Sobolov) and his army of gorillas bring the battle to Earth-1, The Flash (Grant Gustin) and team must find a way to stop them before they destroy Central City. Gypsy (guest star Jessica Camacho) returns to join the fight. Meanwhile, Jesse Quick (guest star Violett Beane) decides she wants to stay with Wally (Keiynan Lonsdale) on Earth-1. VIGILANTE ATTACKS MAYOR QUEEN; Oliver (Stephen Amell) faces his biggest challenge yet as mayor. Felicity (Emily Bett Rickards) continues down her dark path with Helix. After Vigilante attacks Oliver while he’s acting as the mayor, Diggle (David Ramsey) leads the team in a mission to stop Vigilante once and for all. DEAN CAIN RETURNS; When Jeremiah Danvers (guest star Dean Cain) is rescued from Cadmus, Alex (Chyler Leigh) and Kara (Melissa Benoist) are thrilled to have their father back. The Danvers arrange a family dinner to celebrate but things go awry when a suspicious Mon-El (Chris Wood) starts to question Jeremiah about his sudden return.